Every woman deserves a shed of her own, somewhere to retreat to for some quiet time, to create or grow, to write or paint, or just to contemplate the view. 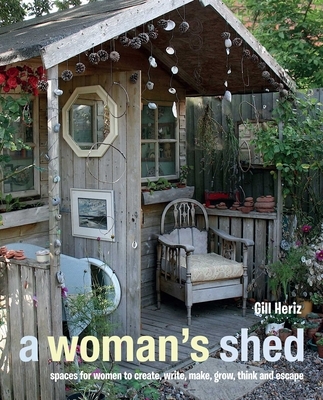 Gill Heriz has interviewed over 70 different women, and Nicolette Hallett has photographed their sheds inside and out, to collect together this unique insight into why women have sheds, and what they do in them. There are sheds for puppet-makers, sculptors, and writers, as well as farmers, furniture-makers, and woodcutters. There are sheds that can be lived in, sheds that are full to the rafters, and sheds that are simply sheds, with the usual collection of gardening tools, lawnmowers, and seed packets. Virginia Woolf once argued that, for women, writing fiction required “a room of one’s own.” These women have taken that premise a step further—to the end of the backyard—to find their own very personal space. Gill Heriz is an artist and writer who was once an interior designer, and has a passion for architecture and design. She is also self-confessedly nosy, and loves nothing more than exploring other people’s houses. She is the author of 'A Woman's Shed' (CICO Books), and her interest in the subject was first sparked by some fine examples in her local area, but now extends across the world. Her current shed is a studio built from old flint, where she can work, create, and relax. She is based in Suffolk, UK.